In late August, I took a photo of the blooms on a tropical Hibiscus growing as a standard in my brother’s backyard by his patio. He and his girlfriend planted it this year. It has been growing beautifully all season. Standard: For those of you who are not familiar with the term standard, it means a plant that has been trained into a tree-form shape. I’m not sure why they call it a standard; seems like it should be called a tree-form plant. A newbie would never use the word standard to search for information about how to grow a plant into a standard, which ends up looking like a topiary. The plant sits as a beautiful round form on the top of a small tree. My brother’s Hibiscus has a twisted 3 branched trunk instead of a single trunk or stalk. These are commonly found in nurseries and give the plant a bit more appeal. A standard plant adds elegance, is a little more formal looking, and can be eye-catching, especially when adorned with spiller plants below in a stunning container garden. But his was transplanted into the ground. At first, when his girlfriend brought it home, it wasn’t doing so hot in the pot. And their apartment doesn’t get much sunlight. (I know, I lived there too before getting my own home years ago), so my Mom, who lives next door, suggested they plant it in the ground. It took off gangbusters style immediately after her wonderful suggestion. The leaves greened up, the stalk increased in size a bit, and the blooms repeated all season long. I warned my brother his tropical Hibiscus plant will not survive our winter in the ground. He chuckled, and responded with, “Oh yah it will. I’m going to build a box around it.” Knowing my brother and his determination, I decided not to argue the point. I was just in one of those moods. I thought, “Okay, little brother, you try that.” Then I continued on my way. But before leaving, I took a couple photos of the blooms. Well, low-and-behold, he called me last night. Usually he calls me about his band’s gig dates, and I post it on Facebook for him. (BTW, he is playing T-day Eve, I’ll be posting the info soon). But this time, his call was to ask me, “How do I store my plant? It is still doing amazing,” he commented. Yup – Dad is right. For the tropical shrub or tree Hibiscus, these have to be taken indoors as a houseplant or can be stored in your basement to overwinter. These plants, hardy in zones 10-11, can survive warmer zones, but here we have to take the steps to move it, or loose it – which he surely would have if he didn’t think twice. Yet, I totally understand my brother’s and his girlfriend’s resistance to take it out of the ground because their plant performed so beautifully by their back porch all summer and still going strong because we have had a warm October. But very soon it will be too cold thus it is time before it is too late. This plant’s reproductive parts in the center of its petals are as lovely, in my view, as the huge dish plate sized blooms that can be anywhere from 5 to 12 inches across in size. Arising from its deep red center star shape pattern, it holds its stamen and pistil upward to the sky as if a sculpture of nature is on display in its garden. The stamen holds the anthers on tiny filaments and the pistil, the female part, rises above on what they call a style (Yup, she’s got “style”). Both the male and female parts partnered as one in this bloom center in honor of survival. As for the huge blooms – they keep going as long as it is warm out – and this went into the early fall for us this year in Connecticut. As my brother noted, it is still thriving as of mid- October. I also appreciate the foliage of tropical Hibiscus plants. Dark green, shiny and fresh looking. Something I admire about certain plants is “fresh” looking foliage. By the way, people often get confused about the Hibiscus types out there. Often I have to tell plant newbies there are many types: tropical, perennial, and shrub. Most folks recognize the huge flowers, but they don’t realize the tropical types won’t survive our climate, like the the perennial Hibiscus would which can look very similar. Hibiscus rosa-sinensis is tropical, known as Rose-of-China (like my brother’s type), but there are many others and lots of cultivars and similar species. Blooms come in almost every color too. Some people are also familiar with the Rose-of-Sharon deciduous flowering shrub, which is hardy for us to zone 5; latin name of Hibiscus syriacus. So you can see the confusion for one that has seen these large blooms for the first time, and wants one to last. Quiet on the phone, I could tell he was listening. He already knew that, he replied. A friend recently asked me on Facebook if she can take her tropical Hibiscus insdie to go dormant over the winter, and it reminded me of a post about this many years ago – Here it is below. I would like to add that basically the answer is yes. They may be moved inside as a houseplant by a sunny window, OR these plants may be stored in the basement (unheated) where it remains cool, dark, and not below freezing. You keep the soil on the dry side (limited watering over the winter months). 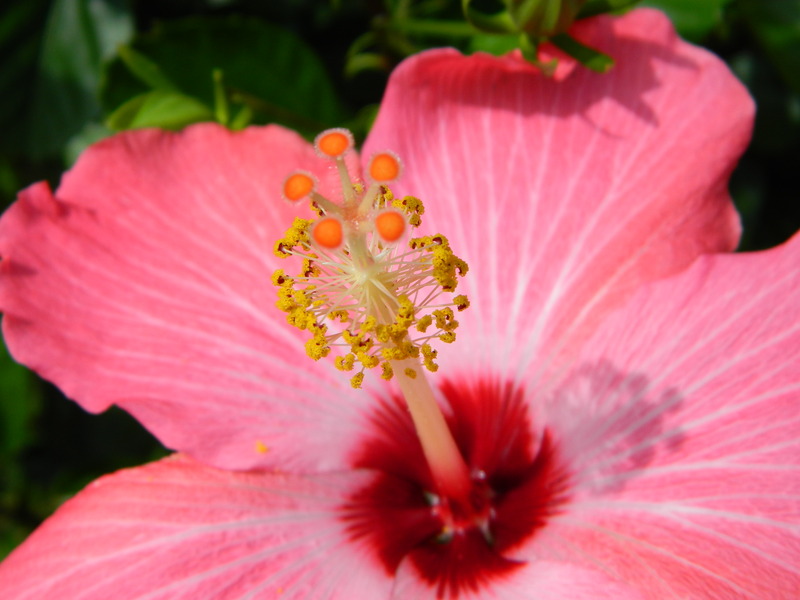 Most tropical Hibiscus are hardy to at least 45 degrees F. Watch out for pests such as aphids or white fly. You may want to have an organic spray handy if you spot any on them after moving them in – look at the underside of the leaves to inspect. Don’t confuse the tropical Hibiscus with those which look similar but are hardy. Some people get confused, as noted on this blog post from years prior. For example, some types of Rose-of-Sharon shrubs have similar looking flowers which folks have confused with a tropical, non-hardy Hibiscus plant. There are “perennial, hardy Hibiscus” plants too – which usually have dish plate size flowers. 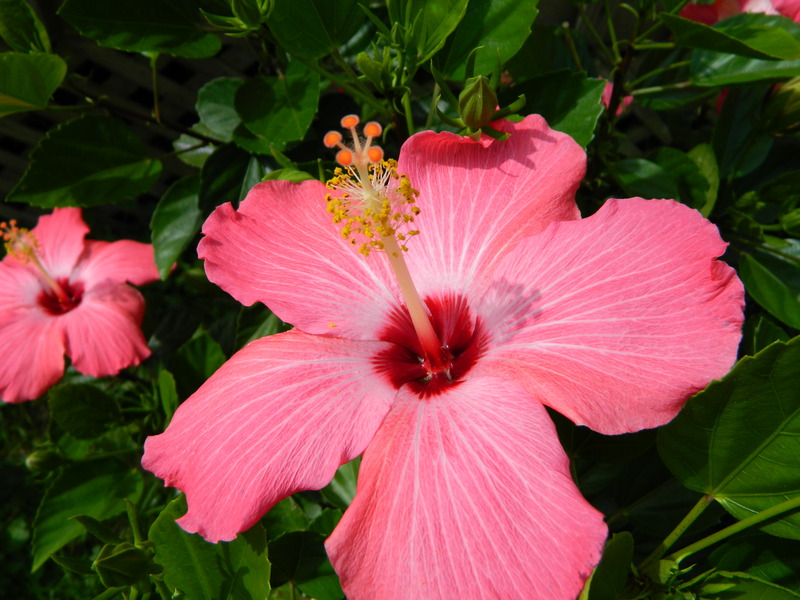 One example is Hibiscus ‘Kopper King’ hardy in zones 4-9. These may be left in the ground over the winter outdoors in Connecticut planting zones.